Winner receives $165,000 Investment, 33 Angel Investors gain insights, due diligence and term sheet training. SEATTLE, WA. – May 16, 2013 — The Seattle Angel Conference announced today that DailyDollar was selected as the winner of its third investment competition, held in Seattle, WA, at the HUB. DailyDollar is a Seattle-based company that began 9 months ago, propelled by participating with Startup Next. Their mission is to eliminate the paper receipt. They are working with merchants to get consumer receipts sent straight to the cloud. 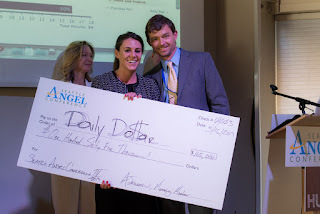 DailyDollar will receive a $165,000 angel award investment. “Our passion, and key difference of the Seattle Angel Conference is that we are bringing new angel investors to the table, giving them training and experience.,” said John Sechrest, founder of the Seattle Angel Conference. “At the same time, we, are helping promising startups improve their business models and hone their pitches, and find their own angel investors” . The other four finalists who pitched were ShiftLabs, a maker of medical devices and other low cost designed devices, Staging and Design Network, a home furnishings network for Home Stagers, Nimia, a platform where premium media producers store, manage and license assets, and Guide Analytics, which provides home services for people with congestive heart failure. This was the third Seattle Angel Conference, and the event has shown strong growth in participation, investment, and innovation. The next Seattle Angel Conference will be held in November 2013. The Seattle Angel Conference is an investor driven conference, connecting early stage and seed businesses with angel investors in the Greater Seattle Area. Their mission is to introduce qualified investors to the potential, process and rewards of angel investing, and equally importantly to encourage, accelerate and showcase startup companies in the Seattle areas and across the Northwest. For more information see www.seattleangel.com.